Around this time last year, I spotted the above photo on the excellent blog the scoop and well, it was pretty much love at first sight. The incredibly cool woman behind that perfect wall also (not surprisingly) had a stellar blog, and it quickly became one of my daily reads. 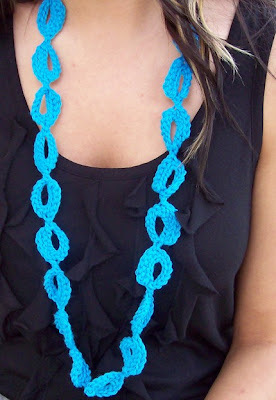 Jenn, has incredible taste, a gorgeous, creative home, an amazing eye + she turns out crochet accessories that are unlike anything I've come across...artful and incredibly lovely -- not unlike Jenn! In a twist on the normal blogger's favorites format, Jenn is sharing her favorite things inside her own home. I love focusing on the lovely and special things already in our lives, so of course I especially love Jenn's list. So without further ado, herewith Jenn's favorites. Enjoy and have a lovely week-end! Hope you're doing something fun... we're making homemade pizzas for Audrey's first sleepover. Lately, I have been spending more time than ever at home. In some ways it makes my day a bit more mundane but I thank it has also made me appreciate the things I have. My favorites are all things I already own, items around the house that seem to bring me some sort of happiness. 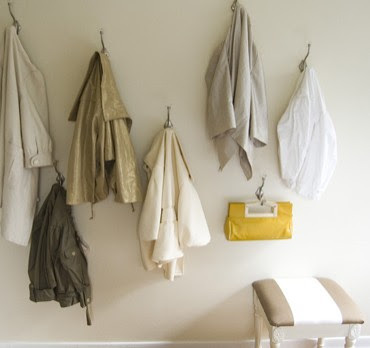 With our first child due to arrive in September, many of my favorites revolve around nursery items! 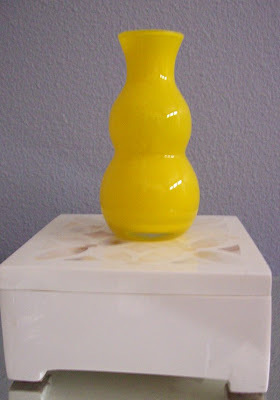 Yellow Vase -- Every morning I wake up to this cheery little bud vase. It's usually empty because we don't have any flowers in our yard yet, but I think it almost doesn't need flowers! Mirror Corner -- This is my favorite corner of our room! Not the best picture, mind you, but I love this magnifying glass. He sits next to my jewelry box and oversized mirror. There's definitely a lot of light reflected from this area! 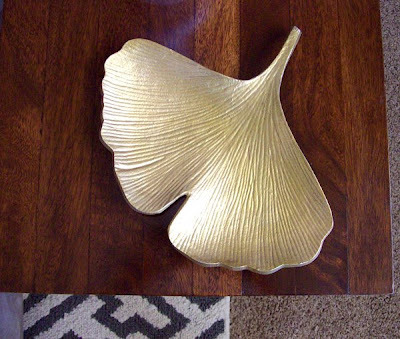 Ginkgo Leaf Dish -- Sometimes I think this is a bit too glamorous for our little house but I still love it. It’s another item in our house that I don't feel the need to fill with anything. I just love the shape of this little leaf, it's just lovely! 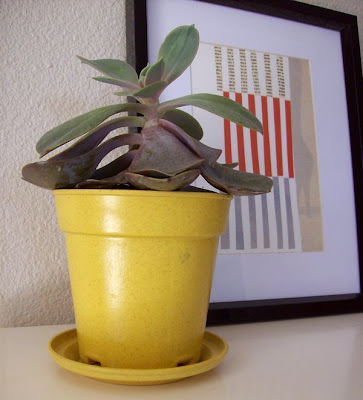 Succulent -- I recently bought this little succulent because I love house plants but we have the worst lighting in our house! So far, this guy has grown very well despite the lack of light. Plus it looks great in front of my Rex Ray collage. 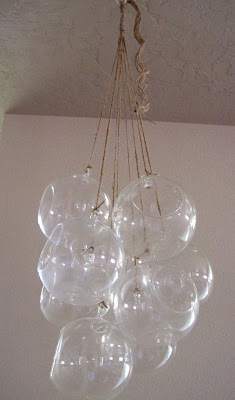 Cluster of Glass Globes -- I tied these together with twine & hung them in our entry. They actually hung inside the church we were married in and I knew I had to find a place for them in our home. For months I couldn't decide what to do with them until I found a ball of twine in our garage and now they greet people as they walk through the door! 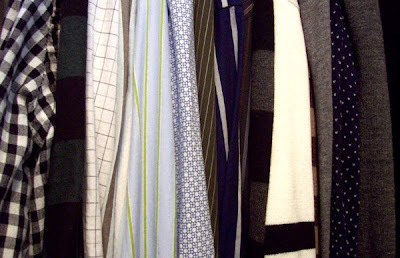 My Husband's Clothes -- These are a favorite because they're actually on hangers!! It's a rare occasion so I really appreciate this! Little Drawings -- These drawings are the originals from a children's book my husband recently illustrated. I just nailed up a stained piece of trim and they all sit in a row in the nursery. I love that it's something my husband made! Moses Basket -- I look at this little basket & rocker every day! 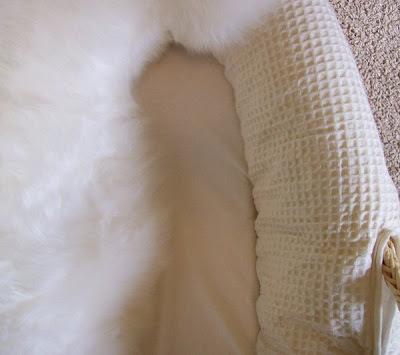 This is one of my favorites because I know our son will be sleeping here the day we bring him home! Plus, I got an amazing deal on the basket & rocker!! 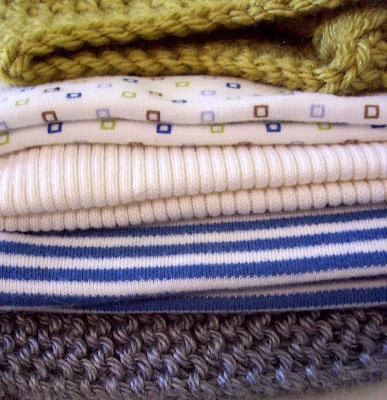 Tiny Accessories -- Looking through my son's tiny hat, scarf, socks and booties makes me so excited! I can't believe he's going to be here in just a couple months! I also like that in everything I have for him, at least one or two things are handmade! Shower Invite -- These is a new favorite for me. My husband designed these library card baby shower invites. We used a real stamp for his due date. They were also surprisingly inexpensive since my mom is a teacher & she was able to hook us up with supplies! What a beautiful list. Love her blog! She has such a great eye for things. I'm going to check out her blog now. Thanks for sharing! Thank you for sharing some of Jenn's favorite things. Her home is lovely and her family is lovely. Loving your blog as this is my first time over! great list! love jenn's taste. I absolutely love the illustrations on the piece of trim! I think I need to "borrow" that idea. LOVE IT. And the baby shower invitation is great! What lovely finds. I'm glad she shared! wonderful post!!! I love those glass globes. what a very cool idea. the blankies are so sweet. congrats. love this blog. putting you on my page. have a great weekend. Thanks for sharing this awesome blog! I love it! This is such a great series. I really enjoy seeing all the lovely things everyone is into. Oh, wow! 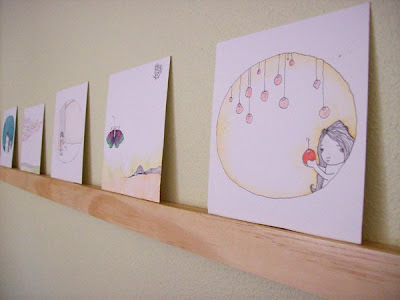 I love the cluster of glass globes and love her collection of drawings! I love Jennifer's style! Everything she creates is just wonderful!!! Jennifer has amazing style - I'm such a fan! I love her take on the "favorites" list. (I wish I could steal the shower invite idea, but I've already had mine sent out... perhaps it's an idea for birth announcements!) The date stamp is my favorite part. 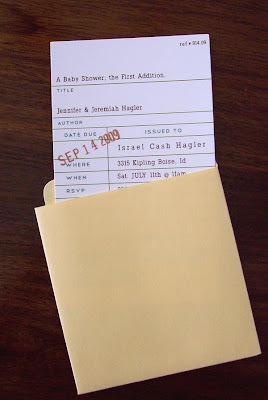 Oh my goodness, I adore the idea of a library slip invite! What a cool Ginkgo leaf decoration! Can you please tell me everything you know about it?